Thirty years ago the craft beer landscape looked quite different even here in Oregon. What was then known as microbreweries, McMenamins was at the forefront of the beer revolution here in Oregon when the McMenamin brothers were part of a small knit group that assisted on getting the “Brewpub Bill” passed in the Oregon legislature. With the passing of this bill it helped pave the way on what we all enjoy here today, an abundance supply of local, craft breweries. 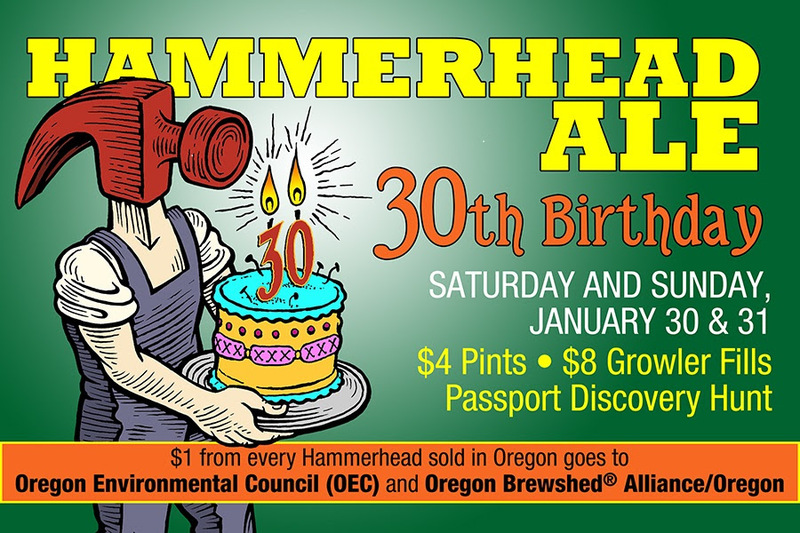 This weekend on Saturday, January 30 and Sunday, January 31, McMenamins will celebrate the 30th Anniversary of its Hammerhead Pale Ale. Thirty years later Hammerhead contributes to about 17% of McMenamins production, though it continues to be brewed in small yields. This past year McMenamins produced 8,484 kegs of Hammerhead. 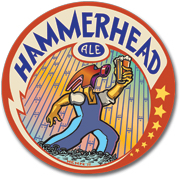 Both days this weekend McMenamins will be offering Hammerhead pints for $4.00 each, Hammerhead 22 oz. bottles to go for $4.50 each and 64 oz growler fills for $8.00 each. Plus McMenamins is partnering with the nonprofit Oregon Environmental Council and Oregon Brewshed® Alliance/Oregon Wild’s Weekend for Water to protect Oregon’s waterways as they will donate $1.00 to these groups for every Hammerhead pint and growler sold in the state of Oregon. Beyond the beer itself McMenamins will also be offering Hammerhead themed food specials this weekend. These specials include the following. McMenamins will also be offering a Hammerhead 30th Birthday Hunt only on Saturday, January 30, 2016. Here are the full details on the hunt and the prizes being offered. Thirty years ago at the humble Hillsdale Pub in SW Portland, our signature brew was born as batch #37 and dubbed Hammerhead. A simple Northwest Pale Ale, Hammerhead has since become the all-time bestselling McMenamins beer, been used in numerous recipes, from whiskey to barbeque sauce, and inspired some of our most iconic artwork. We’ve created another birthday Discovery Hunt to pay homage to 30 years of Hammerhead. Here’s to 30 more! Head to the eight locations below, solve the clue at each spot and snap a photo of yourself with the artwork in question. Once you get your pic, show it to a staff member and you’ll get a stamp. Collect all eight stamps to get a custom Hammerhead 30th Birthday growler and an entry in a drawing for an overnight stay at Edgefield! No purchase necessary, you just have to snag those stamps! Valid on 1/30/16 from open ‘til 10 p.m. only. You can collect your prize at any of the 8 locations. One per person. Ages 21 & over. You must be in each photo. Ringlers Pub: Opens at 11:30 a.m. Hammerhead needs your help! He’s stuck in these statuesque clutches! Rams Head: Opens at 11 a.m. Our favorite little Hammerhead has become a world traveler of sorts, however every now and then you’ll find him tucked away in a local pub. Cedar Hills: Opens at 11 a.m. The beers of yesteryear smile down upon you, take your pick! Market Street: Opens at 11 a.m. Ruby orchestrates a waltz.